The Austrian born Jewish potter Dame Lucie Rie., DBE (1902-1995) was arguably the most influential potter of the Post–War period with an international reputation. In 1938 Lucie Rie left Nazi Austria and made London her home. 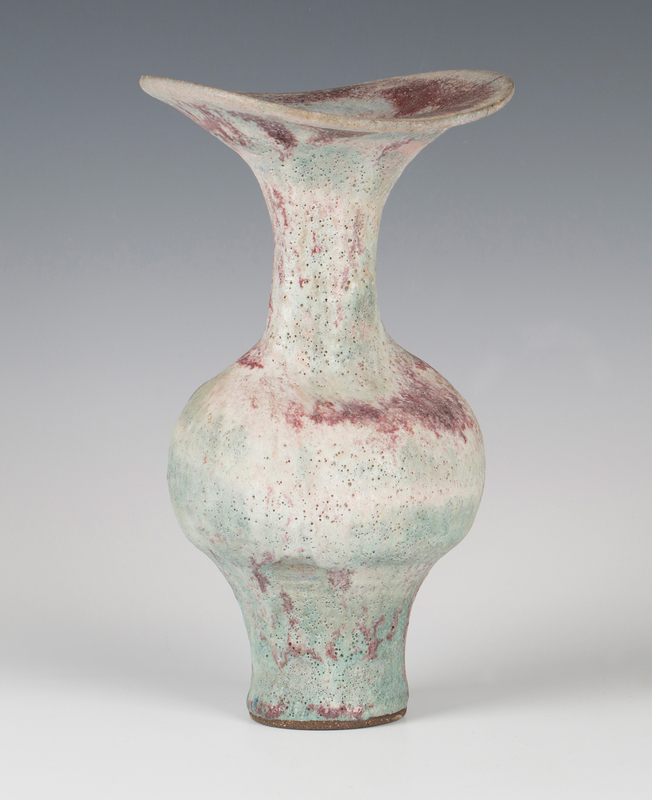 Rie was first exposed to ceramics when she attended the Vienna Kunstgewerbeschule art school. She would later record that from her first encounter with the potter’s wheel she was ‘lost to it’. Her ideas and work was rooted in the Modern Movement and she quickly arrived at the simple thrown cylindrical forms which would define her pots and bowls. Rie experimented with ‘volcanic’ glazes which she would use to beautiful effect on her later stoneware. The famous British potter, Bernard Leach, was amongst her critics. He characterized her work as too thin and lacking in humanity. Despite this rocky start the two potters would become good friends and Rie would profoundly influence British and International Post-War Studio Ceramics. After the war in 1948 Rie began working in stoneware. She adapted Bernard Leach’s porcelain recipe and added lead to his black glaze to produce a wonderful silky black mirror-like glaze. 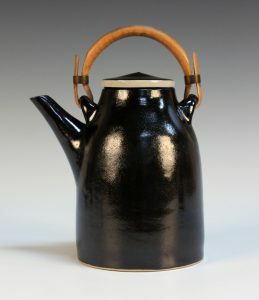 The Lucie Rie stoneware teapot you see here was made for Heal’s in the 1950s. The brown/black glaze with the white tin glazed band is typical of her tableware. These pieces are highly sought after and Toovey’s sold this example for £3800. Lucie Rie exercised great control in the making of her pots. Throwing rings were smoothed away and glaze applied with a brush and gum arabic to help it bond so that its subtlety and thickness could be precisely judged. Despite Rie’s approach her pots never appear mechanical, rather there is a fluidity, a poetry to their form and decoration. The wide rims and flowing forms of her bowls and pots are a testament to the precision of her throwing. The Lucie Rie pot illustrated gains life from its dramatically flared asymmetrical rim as she departs from the round with an ovalled neck. Here she employs her deeply pitted volcanic glaze with a subtle and exquisite range of colour variations. This pot carries a pre-sale estimate of £5000-8000 and is one of a number of pieces by some of Britain’s leading studio ceramicists already entered for Toovey’s specialist Studio Pottery sale. The auction will be held on Friday 22nd March 2019 and further entries are still being invited. The importance and influence of her work is unquestionable. Lucie Rie transformed modern ceramics. She is arguably the most important ceramicist of the Post-War period and her ceramics still command the attention of international connoisseurs.